Andrew Watson has been coaching and mentoring younger athletes for years but has been formally coaching private clients and youth teams since 2012. He believes in a holistic approach to coaching always looking for a balance between the science and mechanics of training and the sometimes hectic world we live in. The ideal client for Andrew is anyone with a desire to improve their cycling be it on the road or off, whether it be someones first ride since childhood or looking for the top step of the podium, AWI Coaching can help. We are a full service digital firm located in Lindsay, Ontario We specialize in helping businesses design, build, implement and deploy effective tools to increase their performance. Our team is made up of designers, coders, photographers, economists, fine artists, teachers, and software specialists. We have covered a lot of ground since starting and would like to let our experience and talent work for your business. 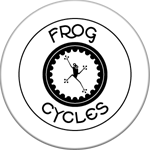 Frog Cycles is about bicycles and how they connect us to the world. Bicycles are used for work and pleasure, exercise and relaxation. They can be anything from strictly utilitarian to exotic works of art. The bicycle can be easily transformed from one purpose to another and can be endlessly personalized and customized for anyones preference. Glass Eagle Studios located in a beautifully renovated 150 year old schoolhouse between Haliburton and Minden on the corner of County Road #21 at 2801 Blairhampton Road. The landscaped property is abundant with perennials, ponds, herb and veggie gardens. With 35+ years experience, Tom's work is inspired by the nature of the Highlands, where his glass work continues to evolve. Integrity Home and Cottage is an profecinal builing company out of Lindsay Ontario who can build your dream home or cottage. Integrity specialzes in, Outdoor Living, Smart Storage, Open Concept and Green Living. Helping you to keep your commitment to the making the world a much better place than when you found it. Carbon emission, global warming, clean water, droughts, floods, and recycling are all words and phrases that have found their way into the main stream of our consciousness. Global warming is no longer debated (reasonably so) for its existence but rather now for viable solutions. We see the environment debated in the news. We discuss issues with our friends and family. Governments and businesses grapple to find ways to have both small and large solutions to what is now becoming a major global problem. We all want to contribute. We want to make a difference, large or small, to make things just a little bit better. Integrity Home and Cottage is no different. The modern world has come a long way in helping us managing our memory, our home, and ultimately almost all dimensions of our lives. We can now check our stove from our smart phone (but not while we are driving pull over first please), and we can see if the alarm was set off by the wind, the cat, or if in fact the neighbor down the road who you didnt trust anyway and they are making off with your new flat screen TV. Open Concept living is a good idea on so many levels; not only for harmonious family living... We see with open-design the tremendous opportunities that present themselves in the interior design and layout of space. Openness offers the flexibility to include both functionality and personal expression to create a wonderful space that is purely yours. Smart-storage deals with the big and the small. Whether it is designing a decompression zone at whichever door you enter the house, or creating a strategy for stowing your seasonal belongings, there is a necessity to designate a home for all of our possessions. Think about all of time and energy you use on a daily basis just trying to keep track of where you left your phone or house keys; wouldn't it be great if you can redirect that energy to dealing with the more important realities of life? Well-organized and well-designed works. We understand that our homes and cottages need to accommodate not only the people, but also the stuff people have, and how they interact with it daily, occasionally, or seasonally. Extending your space to the outside world in a way that is relaxed and comfortable. Designing with a purpose of connecting to the space outside is an important element to any Integrity Home or Cottage. Life carries on beyond the front and back door of any abode, and so smart design needs to ensure that your outdoor living space is crafted to help you take full advantage of what the great outdoors offer. Surrounded by high-tech composite materials and technology at work and turning them into extremely strong and durable high performance prosthetics, while taking part in bike races in the off hours. This was just the right mix for the Lauf seed to start germinating. Benedikt soon realized that he happened to have the right ingredients for ultra-lightweight bicycle suspension, and consequently the Lauf fork idea was born! The Lauf fork is a revolutionary twist on the well known and proven leaf spring suspension concept, combined with today's high performance composite materials. 23km of riding trails, 6km of hiking/running trails, 14 groomed runs chair lifts, and an easy walk-on, walk-off surface lift we proudly provide terrain and facilities for riders and hikers of every age and level of ability. Todd's Independent Grocer is the #1 choose for grocery shopping in Haliburton County. They offer great customer service within every department and have very knowlagable staff about the products that they deliver at it's highest standards.